Halloween in America is a big deal, and like any other major holiday, it’s accompanied by a serious surge in consumer spending. Last year’s holiday broke all kinds of retail spending records, with over $9.1 billion spent on Halloween related items. The real cash cows were costumes and candy—with consumers spending around 3.4 billion and 2.7 billion, respectfully, in these two product categories. These significant numbers are only expected to rise in 2018, and retail stores everywhere will be gearing up to serve the 174 million people who celebrate Halloween annually. What do all these facts have to do with plastic boxes? 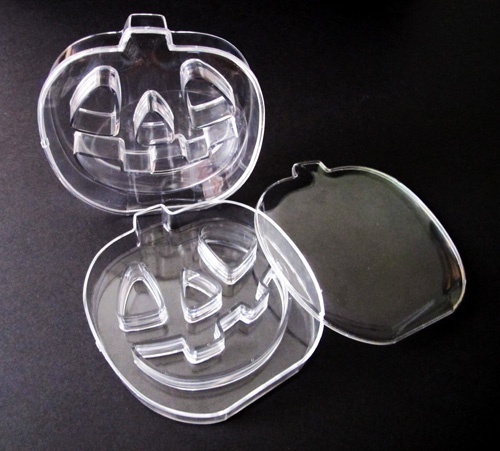 Read along below to see how rigid plastic boxes can serve as the perfect Halloween accessory and put you on the fast track to your spookiest October 31st in recent memory. Nothing is more synonymous with Halloween than candy. However, these sugar-rich products have to survive fluctuations in temperature, humidity in the ambient environment, and product agitation from handling—all before hitting the shelves. Let’s face it, nothing is more disappointing then when someone hands you a completely mashed candy bar while you’re out trick-or-treating. So, in order to maintain attractive color and shape, candy packaging must also be carefully selected to offer a mix of durability and consumer allure—a task that rigid plastic boxes are well suited for. Available in a wide variety of sizes, these boxes stack and display easily, all while shielding your candy products from breakage, compression, and moisture-related spoilage and texture issues. Which Wholesale Plastic Boxes Are Right for My Candy? Preferred shape: heart-shaped, compartment, treasure chest, round top, pumpkin, etc. Halloween costumes have evolved into custom-made, big money investments in recent years. A far cry from the DIY homemade hobo ensembles the kids used to wear, many modern costumes have become full immersion, elaborately designed fashion statements. With the average consumers spending around $87 on their Halloween costume, these advanced outfits need to be protected, both on the consumer and retail sides of the equation. For retail shops, clear rigid plastic boxes offer an upscale way to display and preserve a beautiful costume. A large friction-fit box would provide a new and creative way to showcase costumes on the sales floor. Not only will this keep the costume protected from grabby hands and environmental effects, but it will also add to the prestige of the item you’re displaying. Rigid plastic boxes aren’t simply a means to display your costume products—they’re a smart answer to keeping it attractive and fresh during shipping and storage as well. From a customer’s point of view, how hard is it to find a costume that fits both your physique and your personality (aka alter ego)? Once you do find that perfect fit, you want to hold on to that costume forever. So why not keep it safety stored in a plastic rigid box during the off months? Our rigid packaging safeguards against issues like crushing, tearing, and leaking, keeping your costume in the pristine condition you bought it in. So, by the time next October rolls around, you’ll already have a costume that’s clean, crisp, and ready for you to take your alter ego out for its annual trick or treating adventure—not to mention the extra money (or candy) you have in your pockets from not needing to buy a new outfit. You’ll be looking so sharp, you might even win the costume party next year! As the largest manufacturer of high-quality rigid plastic boxes in New England, Alpha Rho has been a leading supplier of injection-molded plastic boxes, with a reputation for providing dependable plastic packaging solutions for over 50 years. Our custom rigid plastic boxes— compartment, hinged, friction fit, custom shapes—are used extensively in multiple industries, such as retail and hobby, food and confectionary, medical, and industrial. If you’re having trouble deciding, contact us for recommendations, orders, and assistance finding the perfect look and fit for your products.